English for Academics is a communication skills course for academics who need to work and socialise in English. Aimed at B1 level and above, this two part series practises using English in a range of situations, from making small talk at a conference to giving a presentation, from reading a range of academic texts to writing academic correspondence. 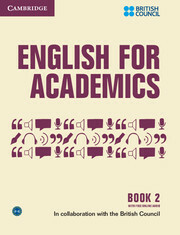 English for Academics was written in collaboration with Svetlana Bogolepova, Vasiliy Gorbachev, Olga Groza, Anisya Ivanova, Lyudmila Kuznetsova, Tamara Oschepkova, Irina Pervukhina, Ekaterina Shadrova, Svetlana Suchkova and project consultant Rod Bolitho. 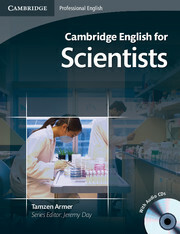 Cambridge English for Scientists is a short course (40-60 hours) for student and professional scientists.